China is currently the world’s largest consumer market for food and beverages. With improved standard of living, Chinese consumption habits have changed markedly. Greater purchasing power has brought a shift in local consumer preferences; Chinese are demanding more premium alternatives, higher quality food products from brands they perceive as trustworthy and safe, among them, imported foods. To date, China is the world’s top importer of food, with an estimated value of 480 billion CNY (US$77 billion). Strong demand for food imports across different products categories – fresh produce, packaged foods and animal protein – is likely to increase, due to the country’s insufficient food supply and growing concerns over food security. Discerning and quality-conscious, Chinese consumers place high value on food quality and safety, and often associate these attributes with imported foods. More than 80% of Chinese consumers are inclined to purchase imported food products. The experience of Nestlé – a global food brand – demonstrates the value of properly localizing branding and products, establishing goodwill amongst Chinese consumers and devising an effective marketing strategy with online components. To succeed in China’s food market, businesses should: 1) determine how to feasibly sell in China, 2) localize their brand and product(s) as needed, 3) deploy an effective marketing strategy, 4) find reliable distributors and establish diversified sales channels, and 5) find a professional local partner to help navigate common challenges and carry out necessary due diligence and preparation to reduce costs and maximize long-term returns. Several key factors – a massive population of nearly 1.4 billion, increased consumer spending power and growing urbanization – transformed China into the world’s largest consumer market for food and beverages, surpassing the United States in 2011. China’s food supply is insufficient to support its large population. For this reason, it is heavily reliant on imports to supplement domestic production. China is predicted to be the world’s top importer of foreign food products by the end of 2018, with total food imports valued at 480 billion CNY (US$77 billion). With more than 80% of Chinese consumers willing to purchase imported food products, China’s food market offers great potential to both established foreign brands and new entrants alike. China has experienced rapid urbanization over the last three decades. The urban lifestyle of most Chinese consumers, along with their increased disposable incomes, has changed their overall food consumption patterns and dietary habits. Chinese consumers consume fewer vegetables and grains, and more meat, poultry, seafood and dairy products. They are skeptical and quality-conscious, with over 86% of buyers sensitive to food quality and safety, a result of China’s highly publicized food safety scandals. High-income households from tier-1 cities like Shenzhen, Shanghai, and Beijing are thus more willing to pay a premium for imported food items, which they consider more likely to be higher quality and safer. Fresh produce includes farm-produced crops, mainly fruits and vegetables. China’s fresh produce retail industry reached estimated revenues of $41.6 billion in 2017. Statista reported China’s agricultural imports valued at US$1.1 billion (fruits) and US$232.9 million (vegetables) in 2018. The market growth can be attributed to young fitness-oriented consumers opting for a low-calorie diet. Citrus and apples, and small fruits like cherries and grapes, remain the most valuable products in the fresh produce category due to strong consumer demand for quality counter-seasonal fruits in tier-1 cities. Animal protein consumption consists primarily of meat and poultry products. China’s rapidly growing meat market was valued at US$200.4 billion in 2016, with a modest growth rate of 2.2% from 2011 to 2016 and predicted growth rate of CAGR of 4.2% by 2021. 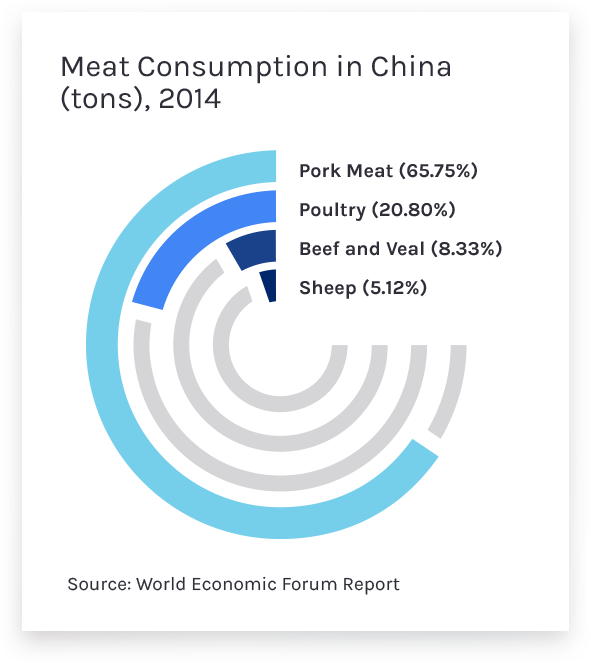 China’s total meat imports (beef, pork, and poultry) are forecasted to reach 6 million tons by 2020. Higher income consumers are shifting from traditional protein sources like pork and poultry to premium alternatives like imported beef. Packaged foods include commercially produced convenience foods which are shelf-stable and require minimal preparation such as ready-to-eat food items, noodles, snack bars, baby food as well as canned and preserved goods. According to Euromonitor, retail revenues for China’s packaged food market reached 1.2 billion CNY (US$176.69 million) in 2013, with an average annual growth rate of 12.3%. Revenues are forecasted to rise to US$347 billion by the end of 2018. Responsibility for this sales boost rests with the increasing number of Chinese urban residents, whose preferences are shifting towards on-the-go Western-style food products like chips, soda, cookies, cereals, snack bars readily available at local convenience stores. The AUA SpectrumThe Awareness – Understanding – Affordability (AUA) Spectrum tells you who to sell to, where, and at what price. Many firms fail in their attempts at market entry in China because they have not measured the feasibility of selling their products in China and if feasible, where their product falls along this spectrum, so they can effectively target and invest resources. Effective marketing is critical to brand development in China’s highly competitive food market. Traditional offline marketing channels like TV advertising and print, which worked so well in the past, have become less popular, and understandably so, with Chinese audiences becoming more Internet-savvy. In 2016, China’s online user population rose approximately 721 million whereas the TV subscription base grew only to 313 million. Online platforms with millions of userbase like WeChat, Weibo and Baidu are appealing than the offline variety—particularly among urban consumers and offer a far better return on investment than traditional media. Foreign companies that invest heavily in traditional marketing channels over those online find themselves drained of resources and time with little to show for it, often leading them to exit the Chinese market altogether. If any of these companies had simply adjusted their marketing strategy for the unique nature of the Chinese market, they could have succeeded. New distribution channels, online platforms, in particular, are becoming increasingly popular. Chinese consumers prefer the transparency and convenience that comes with food e-commerce. Selling food products online, either through local distributors or directly-owned operations, is, therefore, a viable business model in China. The key, in this case, is creating an effective online shop or your own website, securing warehousing and finding a reliable fulfillment company. In China, the value placed on food varieties, their quality and price structure is high. Distinct local flavors are deeply rooted in tradition, presenting huge challenges to foreign companies desiring to tap into the Chinese food market. Failure to understand China’s diverse local consumer market is a common pitfall for foreign firms, often struggling to communicate or alter their brand to accommodate Chinese culture, ways of thinking, and consumer values. Thus, localization is the key to success in China. Localizing your food products – incorporating regional flavors and catering to local tastes and packaging preferences – is important. It is essential that your brand resonates with the wants of Chinese consumers so that it will stand out in their mind as distinct as they’re faced with ever-increasing options when shopping food items. Working with local distributors is often viewed as a quick and easy way to start selling in China. A key advantage of this distribution model is that local distributors have established logistics infrastructures, government-related guanxi (connections) and broader networking reach. The problem is that most foreign producers and companies do not have the local presence to conduct thorough distributor assessment, including their capabilities and their suitability as a long-term partner in China. Conducting due diligence is critical and difficult as some local distributors are informal or do not understand their obligations and the best way to check is by investigating locally. Large distributors usually have a regional or national reach and focus on distributing through supermarket chains like Carrefour and Wal Mart. They are pragmatic, risk-averse and will likely focus on consumer-attractive food products from popular foreign brands which are easier to sell. This becomes a problem for small and medium producers, whose little-known product offerings may be subject to unfavorable distributorship agreements. Nestlé S.A. is a global food and beverages company headquartered in Switzerland. It is now the largest food company in the world, ranking 64th on the Fortune Global 500 in 2017. The firm is among the first foreign brands to enter the Chinese food market and has grown into one of the most trusted foreign food brands in the country. Nestlé’s success is due to multiple factors. First, it executed an effective goodwill strategy for its brand, earning positive consumer reception through localizing its supply chain, featuring locally sourced ingredients in product formulations, investing in China’s agrarian capability and providing livelihood opportunities to local communities. Second, Nestlé prioritized flavor adaptations to suit regional consumer preferences in China. Ice cream products sold in Harbin (North East), for instance, are heavier and usually topped with chocolate and cream, while those sold in Shenzhen (South China) are lighter and refreshing. Third, their brand building strategy was tailored to current marketing trends. In 2016, its partnership with Alibaba (the larges ecommerce platform in China) and the launch of its products on Alibaba-owned Tmall.com led to triple-digit growth rates. China’s food market is highly fragmented and competitive. New market entrants face stiff competition, which makes feasibility assessment more important. This includes several components. First, assess affordability. Concrete data showing whether Chinese consumers can afford your product and, if so, which ones and where. This will allow you to focus time and direct resources on areas where you have a high probability of achieving commercial success. Second, measure the level of consumer awareness and understanding of your product. This will indicate how much time and resources you will need to familiarize consumers with your food product, and why they should buy it. This is a necessary precursor to budgeting for and developing your marketing strategy. Finally, you need to know to what extent–if any–you should localize your brand or product to make it more readily understood and attractive to Chinese consumers and how that impacts the financial feasibility of entering the market. This will save you time, money, and headache, enabling you to enter the Chinese market with confidence and a clear idea of how to grow your business there. Large producers are going to focus on developing relationships with large distributors in China with regional or national reach. Such companies also have the internal resources to conduct proper due diligence and navigate China’s legal landscape. Small and medium producers, by contrast, are going to find more interested partners in local or provincial distributors. Although many such distributors are experienced, reliable, and have well-established distribution channels, there are distributors who are not as capable as they seem. Any government records which might exist, are likely to be solely in Chinese and difficult to verify. Although producers can try to carry out proper due diligence on their own, it’s best to work with a local third party to do this, taking advantage of their understanding of the Chinese market, legal landscape, language, regulatory system, and way of doing business. Once a company has identified a suitable local distributor which has passed inspection, the third party can assist with establishing a formal relationship with the distributor and ensuring all agreements are fair, transparent and legal. Most foreign companies assume that their Western product – successful as it is in their homeland – will seamlessly fit into China’s market, only to get disappointed by lackluster results. It can be overwhelming to break through in China, thus, your brand must be responsive to local consumer tastes and flexible enough to cater to their changing preferences, but also uniquely distinct from local competitors. Invest the time and resources necessary to understand Chinese consumers’ motivation for purchasing and values so you present your brand and communicate your message in a way that resonates with local consumers. This will pay dividends in the long-term and allow you to more easily differentiate yourself in an increasingly crowded market. Educate Consumers Chinese consumers are highly skeptical of food quality and safety, as a consequence of controversial food scandals that previously plagued China’s food market. To restore consumer confidence, product traceability and supply chain transparency are important. Let the Chinese consumers know about the origin of food products, the ingredients, formulations, quality, varieties, history, and culture. This can build a good first impression, increase demand and familiarity, create brand awareness, increase the perceived value of the brand, and eventually build brand loyalty. It is important in any market for companies to adopt a marketing strategy that appeals to their target consumer base. Majority of imported food consumers in China consist of higher income households from tier-1 and tier-2 cities. Young, tech-savvy Chinese consumers account for 56.3% of the total online retail consumption, preferring online purchases of food imports over in-store purchasing experience. They also turn to popular online platforms like Baidu, Weibo, and WeChat as a source of information about their food choices and place orders on Alibaba-owned T-mall for their imported food supply. China’s food e-commerce has grown into a highly profitable market, with revenues for online food sales reaching 100 billion CNY in 2016 according to Boston Consulting. Thus, foreign brands should invest in cost-effective online marketing to expand their audience reach while developing their brands in China. The shift in Chinese consumers’ food consumption habits – as a result of rising incomes and urbanization – has created strong and growing demand for imported food products. Increasing number of consumers deeply concerned with food safety seek quality and safety associated with imported goods and are willing to spend more on them. The ever-growing consumer demand for food imports in China offers great opportunities for foreign producers, regardless of size, to tap into China’s food market. Companies wishing to sell in China should: 1) determine how to feasibly sell in China, 2) localize their brand and products by adjusting to local and regional flavors and preferences 3) deploy an effective marketing strategy that includes a mix of offline and online components 4) find reliable distributors and establish diversified sales channels and 5) find a professional local partner help navigate common challenges and carry out necessary due diligence and preparation in order to reduce costs and maximize long-term returns. Feasibility can be determined by measuring the affordability of your food product, creating an appropriate pricing strategy, understanding existing competition, assessing consumer awareness and understanding of your product, and geographic targeting. Localization can be addressed by assessing to what extent your brand and/or product(s) ought to be adjusted (in terms of flavor adaptation and packaging) to fit the Chinese consumer market and how this can be done within a defined budget.